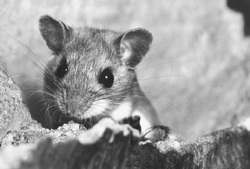 Hantavirus may cause hantavirus pulmonary syndrome or HPS. Hantavirus pulmonary syndrome is a cardiac and pulmonary associated disease with high index of mortality. Hantavirus pulmonary syndrome was first manifested in 1993 in a group of patients in southwestern USA. From 1993 to 2010 there are 541 cases in 31 states are reported. The incidence of hantavirus pulmonary syndrome is associated with the population of the deer mouse . When the disease was first reported in 1993, the population of the mouse in the Southwestern USA had increase dramatically. Some if the illness is associated with an increase in indoor invasion of home by field mouse. There are also cases in south and central America. The risk factors for developing Hantavirus pulmonary syndrome are exposure to white footed mouse, rice rat,cotton rat and deer mice as well as rodent that is infected usually from the dropping and urine. Special care should be taken by the pest control worker, construction worker, people who sleep on the ground and farm laborer as well as ex terminators. People cleaning and opening an unused building and cabins, hikers and campers are also predispose to Hantavirus pulmonary syndrome. Generally Hantavirus pulmonary syndrome is prevented by controlling rodent population in and around home, preventing habitation of field mice in the houses, avoiding any areas with large population of mice, use respirator, especially for exterminators who deal with many dead mice and universal isolation is needed for Hantavirus pulmonary syndrome in hospital. Hantavirus may affect the endothelium and vascular permeability which causing the functional impairment of vascular function and finally lead to shock and pneumonitis. The virus which causes Hantavirus pulmonary syndrome is known as Sin nombre virus which is an RNA virus of the genus Hantavirus that belong to family of Bunyaviridae. Many cases with similar symptoms may occur in south and north America. Rodent acts as reservoir for the zoonotic infection. Deer mice ( Peromyscus maniculatus), cotton rats ( sigmodon hispidus), rice rat ( oryzomys palustris) and white foot mice ( Peromyscus leucopus). Inhalation of virus containing aerosol of saliva, urine and rodent feces may lead to infection. Person to person spread may occur however it is very rare and usually occur due to exposure of body fluid which is infected. In south America, Andes virus has been reported and there have been outbreaks in Chile and Argentina with human to human transmission. The prodrome period for Hantavirus are usually from 4 -10 days while the incubation periods are from 8 - 28 days. After prodrome, patient will develop abruptly shortness of breath and cough which progress into respiratory failure within hours. Patient may also present with headache, fatigue, myalgia and fever and non specific flu like symptoms or gastrointestinal symptoms. On hospital admission, tachypnea is the most common finding. On physical examination, the patient may look dyspneic and present with signs of respiratory distress. Rhonchi, pulmonary rales and cyanosis are also common. During the acute phase of illness, patient may present with shock, pneumonitis and pulmonary edema. Death may occur due to ventricular arrhythmias and shock. The laboratory investigation may reveal thrombocytopenia and leuckocytosis with atypical lymphocytes. It is common for acute hypoalbuminemia to present. Besides that elevated amylase, LDH and liver function test may occur. Myositis is consistent with raised creatine phosphokinase. Early in the course of disease , proteinuria and mild azotemia may occur. Renal failure is a rare complication. Besides that disseminated intravascular coagulation and hypoxemia may also occur. Imaging technique may include chest x ray and chest tomography. Chest x ray may reveal pleural effusion, pulmonary edema, interstitial infiltrate and alveolar infiltrates. Chest tomography may show pleural effusion and interstitial infiltrates. Other procedure include polymerase chain reaction ( PCR) for detection of Hantavirus in tissue or blood, serological testing for detection of rising titers of IgG and IgM and immunohistochemistry test in tissue for detection of Hantavirus antigen. Hantavirus that enter the blood stream ( viremia) may lead to capillary leak syndrome that present with respiratory failure, shock and pneumonitis. The differential diagnosis of Hantavirus pulmonary syndrome are hypersensitivity pneumonitis, pneumocystis jiroveci pneumonia, pulmonary edema, fungal or bacterial pneumonia such as histoplasmosis, leptospirosis, coccidioidomycosis, chlamydia, group A streptococci, pneumonic plaque, tularemia, anthrax, Legionnaire’s disease and mycoplasma and viral pneumonia. The treatment may include supportive care, oxygenation and mechanical ventilation as well as broad spectrum of antibiotics while conforming the present of Hantavirus infection. The treatment is follow later by extracorporeal membrane oxygenation. Patient initially require admission to the hospital and in severe cases of hypoxemia may need to be transfer to ICU. Patient will require an admission if present with respiratory distress or any exposure to rodents. Patient will be discharge if hemodynamically stable and the infection is clear. The complication of Hantavirus pulmonary syndrome are myocardial depression, adult respiratory distress syndrome, respiratory failure ( mechanical ventilation) shock and death. Mortality rate is about 30% - 40% . Fulminant illness in patient with Hantavirus pulmonary syndrome carries a poor prognosis.